Many a video application maker claims to have built a ‘Chatroulette for Facebook’, meaning an app that enables random video-chat connections between Facebook users in real-time. 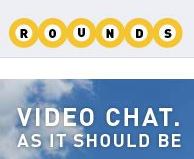 Rounds.com also has such an app, but offers a bit more than just video-based meetings between random people. Already at 335,000 monthly active users and counting, Rounds’ Facebook app now boasts a ‘Random Rounds’ feature that lets people interact with strangers, but also play games and share photos, among other activities. Rounds says the biggest difference between their app and other video chat platform providers is that it offers online experiences that mimic real-life personal encounters. Users can play with fun webcam effects, collaboratively watch YouTube videos, play multi-user interactive games, draw on whiteboards, send virtual gifts to one another, write texts and browse websites together, all in a single environment. The Rounds platform currently offers over 20 different games and activities. The company also debuted an API (launched in May 2010) that enables third-party developers to create additional games and experiences. To avoid inappropriate behavior using the Random Rounds feature, Rounds says only members with more than 100 friends can use it, usage is restricted to users within the same age group (based on their Facebook profile), and clearly displaying identifying information of other users. In addition, there’s built-in reporting functionality to weed out the ‘bad’ users. Rounds.com was founded in 2008 and has raised $2.5 million in venture capital funding.